Welcome to the ISRAEL SPIKES FAMILY page! THE ISRAEL SPIKES FAMILY PICTURE. I believe this picture was taken about 1876. 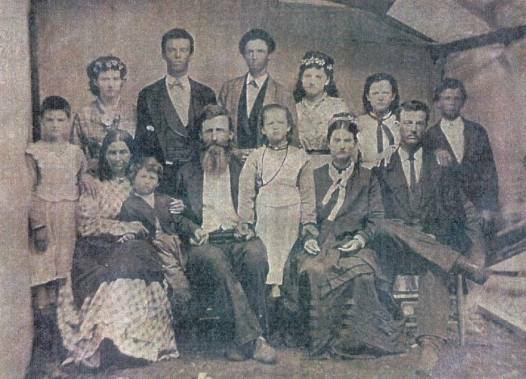 MOTHER, Louisa Erwin Spikes; Jarred Erwin(born 1870); Father, ISRAEL SPIKES; Claudia(Claude)-had a twin who did not live(born 1865); Ophelia(born 1851); Lawrence Calhoun(Bud or Daddy Spikes-born 1854). Marion(Female-born 1868); either Caldonia Maria(born 1860) OR Louisa Frances(born 1861); either Marshall Osbourne(born 1856) OR John Allston(Austin)(born 1857); either Marshall or John; either Caldonia or Louisa; Nancy Letta(born 1866); Israel Henry(born 1864). After his father's first wife died, he married Lucinda Carter. John Edward Spikes and Lucinda McCoulsky Carter had 7children that I know of. They were: George Washington (b.1834), James Jefferson (b.1846), Lucinda Elizabeth (b.1850), Willie J. (William, Willis) (b.1852-d.1865), Viola Frances(b.1854), Texana Rebecca(b.1857), and Samuel Cassidy(b.1859). Israel Spikes was born in Clark Co., AL. He had auburn hair, grey eyes, and was light complected. He was a farmer. He enlisted with the Terrell's Texas Cavalry on Dec. 15th, 1862, at the age of 37. He served as Capt. before resigning on medical leave on Dec. 7, 1863. As you can see in this picture of Israel and his family, he had a lot of kids. I have heard many opinions on the way that the name of Spikes came about. Some people believe that the name SPIKES is the same name as: SPEIGHT,SPEIGHTS, SPAKE, SPAKES, SPATE, and SPATES. One opinion is that through the generations the spellings have varied because of the difference in a person's accent, which could change the way they would spell their last names. Or, sometimes if the people traveled over seas, many times the name would change spellings. The information on this site was gathered by people exchanging information. Some information may differ from what others have found. This is all in good fun.